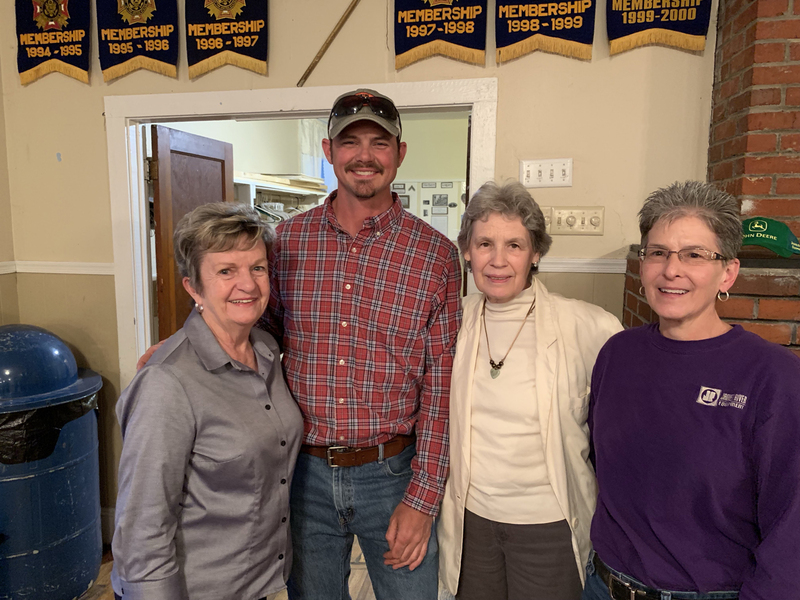 "Your Connection To Community And Business Growth"
Tripp Maxey, second from left, and Lori Gilroy, far right, spoke to the Buckingham Chamber of Commerce Tuesday night during its “How’s Business?” series. Maxey owns and operates Tripp Maxey Construction and Gilroy operates James River Equipment in Dillwyn. Both discussed the respective states of their businesses, their challenges and their successes. “The Chamber is proud to have Tripp and Lori representing their businesses, and we welcome other businesses to Boone for the small fee of $35 a year, which covers all monthly meetings, networking events, meet and greets, special promotions, discounts, and more,” said Chamber Vice President Jordan Miles. Pictured with Maxey and Gilroy and Sandra Moss, far left, and Janet Miller, second from right. Pictured are, from left, Chamber Leaders Donna McRae Jones, Eddie Slagle, Faye Shumaker, Janet Miller, Jordan Miles, Hank Hagenau, and Kyanite staff Casey Gunter, Javannah Taylor, Ashley Glenn, Dan Batchelor, Sallie Mowbray, and Michael Wells. Kyanite Mining Corp. was recognized Monday for the businesses' efforts in keeping the roadways across Buckingham County clean and litter-free. The Buckingham Chamber of Commerce bestowed its Community Pride Award for the month of April to Kyanite Mining, one of Buckingham's largest employers. This is the first time this year the award, which seeks to commend and recognizes businesses for continued or new improvements to their grounds and facilities, has been presented. 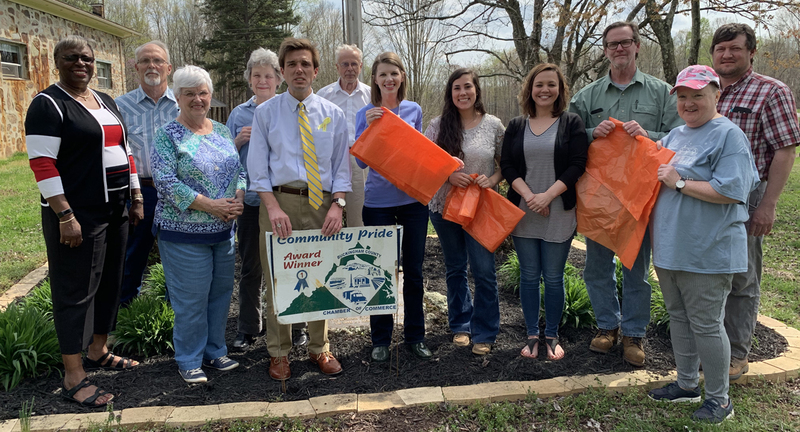 "Kyanite Mining, whose employees recently picked up more than 600 bags of litter along more than 20 roads in an effort to keep Buckingham beautiful, is very, very deserving of this award from the chamber," said Community Pride Award Committee Co-Chairman Jordan Miles. "The chamber is proud to have Kyanite, not only as an active member of our organization, but a great partner and asset to Buckingham. Kyanite supports its people, no matter if they live and/or work here, but also the community as a whole. This recognition is very due to this terrific group of people and a fantastic business." According to Kyanite, a majority of employees were out during the day-long litter pickup, which included a picnic to celebrate the employees. Kyanite is a family-operated and privately-owned company based on U.S. Route 15 near Dillwyn. The firm is the world’s largest producer of industrial kyanite and calcined kyanite (mullite). The company mines kyanite-bearing quartzites associated with felsic and mafic volcanic rocks of the Chopawamsic Formation in the central Virginia Piedmont region. "Kyanite employees work, live and enjoy life in Buckingham County, and we're proud they're here," Miles said. For more information on the Buckingham Chamber of Commerce, call 434-983-2372 or email info@buckinghamchamberofcommerce.com. Dues for membership are only $35 a year.